An arteriovenous malformation (AVM) is an abnormal tangle of blood vessels in the brain or spine. Some AVMs have no specific symptoms and little or no risk to one’s life or health, while others cause severe and devastating effects when they bleed. Treatment options range from conservative watching to aggressive surgery, depending on the type, symptoms, and location of the AVM. Normally blood flows from the heart through large arteries to all areas of the body. The arteries branch and get smaller until they become a capillary, which is just a single cell thick. 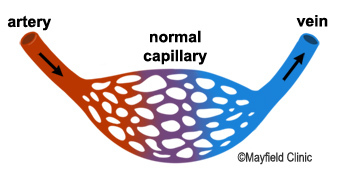 The capillary bed is where the blood exchanges oxygen and nutrients with the body tissues and picks up waste. The blood travels from the capillary bed back to the heart through veins. Figure 1. An AVM is a tangled bundle of blood vessels where arteries connect directly to veins with no capillary bed between. This creates a system of multiple feeding arteries, the tangle or nidus, and enlarged draining veins. Arteriovenous malformation – abnormal tangle of blood vessels where arteries shunt directly into veins with no intervening capillary bed; high pressure. Cavernoma – abnormal cluster of enlarged capillaries with no significant feeding arteries or veins; low pressure. Venous malformation – abnormal cluster of enlarged veins resembling the spokes of a wheel with no feeding arteries; low pressure, rarely bleed and usually not treated. Capillary telangiectasia – abnormal capillaries with enlarged areas (similar to cavernoma); very low pressure, rarely bleed and usually not treated. Dural AV fistula – direct connection between one or more arteries and veins into a sinus. The veins of the brain drain into venous sinuses (blood-filled areas located in the dura mater) before leaving the skull and traveling to the heart. Dural AV fistulas and carotid-cavernous fistulas (CCF) are the most common. AVMs can form anywhere there are arteries and veins. Brain AVMs can occur on the surface (also called cortical), deep (in the thalamus, basal ganglia, or brainstem), and within the dura (the tough protective covering of the brain). Type 1 - (most common) is a dural arteriovenous fistula. They usually have a single arterial feeder and are thought to cause symptoms by venous hypertension. Type 2 – (also called glomus) is intramedullary and consists of a tightly compacted nidus over a short segment of the spinal cord. Type 3 – (also called juvenile) is an extensive AVM with abnormal vessels both intramedullary and extramedullary. Type 4 - are intradural extramedullary arteriovenous fistulas on the surface of the cord. An AVM can rupture and bleed into the brain, an event called an intracerebral hemorrhage (ICH), or it can bleed into the space between the brain and skull, an event called a subarachnoid hemorrhage (SAH). Small AVMs (less than 3 cm) are more likely to rupture than large ones. The bleeding can cause a stroke. AVMs can grow large and create pressure against the surrounding brain, resulting in seizures and hydrocephalus. This is more common in large AVMs. AVMs can reduce the amount of oxygen delivered to nearby tissues. Because the blood flows directly from the artery to the vein, cells that normally get oxygen from the capillaries begin to deteriorate. The risk of AVM bleeding is 2 to 3% per year. Death from the first hemorrhage is between 10 to 30%. Once a hemorrhage has occurred, the AVM is 9 times more likely to bleed again during the first year. For example, a 25-year-old man has an 80% lifetime risk of bleeding (at least once). Many factors affect this percentage, including where the AVM is located and what type of AVM it is. It's best to talk to your doctor about your own individual risk. The cause of AVMs is unknown, but researchers believe most occur during fetal development. AVMs of the brain and spine are present at birth, but are usually not hereditary. AVMs are relatively rare, more common in men, and most often cause symptoms between 10 and 40 years of age. AVMs account for about 2% of all hemorrhagic strokes each year. Whether you or a loved one was brought to the emergency room with a ruptured AVM or are considering treatment options for an unruptured AVM, your doctor will learn as much as possible about your symptoms, current and previous medical problems, current medications, and family history. He or she also will perform a physical exam. Diagnostic tests are used to help determine the AVM’s location, size, type, and involvement with other structures. Computerized Tomography (CT ) scan is a noninvasive X-ray to view the anatomical structures within the brain to detect blood in or around the brain. A newer technology called CT angiography involves the injection of contrast into the blood stream to view the arteries of the brain. This type of test provides the best pictures of blood vessels through angiography and soft tissues through CT. Magnetic Resonance Imaging (MRI) is a noninvasive test that uses a magnetic field and radiofrequency waves to give a detailed view of the soft tissues of your brain. An MRA (Magnetic Resonance Angiogram) is the same non-invasive study, except that contrast dye is injected through an IV to illuminate blood vessels. Angiogram is an invasive procedure, where a catheter is inserted into an artery and passed through the blood vessels to the brain. Once the catheter is in place, a contrast dye is injected into the bloodstream and the X-ray images are taken (Fig. 2). Figure 2. Angiogram depicts a large AVM in the parietal lobe of the brain. 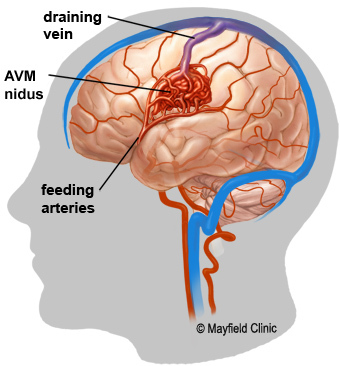 Feeding arteries lead to a tangled nidus that shunt blood directly into a large draining vein. Surgery, endovascular therapy, and stereotactic radiosurgery can be used alone or in combination to treat an AVM. Endovascular embolization is often performed before surgery to reduce the AVM size and risk of operative bleeding. Radiosurgery or embolization may be used after surgery to treat any remaining portions of the AVM. Your neurosurgeon will discuss with you all the options and recommend a treatment that is best for your individual case. If there have been no previous hemorrhages, the doctor may decide to observe the patient, which may include using anticonvulsants to prevent seizures and medication to lower blood pressure. Radiosurgery aims precisely focused beams of radiation at the abnormal vessels. The two main technologies are the Leksell Gamma Knife and linear accelerator systems, such as the BrainLab Novalis. The procedure takes several hours of preparation and one hour to deliver the radiation. The patient goes home the same day. After 6 months to 2 years, the vessels gradually close off and are replaced by scar tissue. The advantage of this treatment is no incision and the procedure is painless. The disadvantages are that it works best with smaller AVMs and may take a long time to show effect (during which time the risk of hemorrhage exists). In a recent long-term study, 90% of patients had obliteration of their AVM 5 years after stereotactic radiosurgery, and 4% of patients experienced repeat hemorrhage during the waiting period . 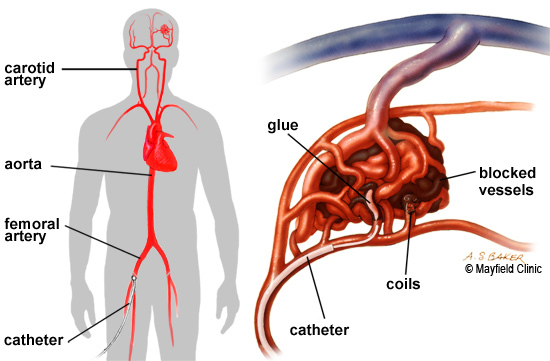 Embolization is a minimally invasive procedure that uses small catheters inserted into your blood vessels to deliver glue or other obstructive materials into the AVM so that blood no longer flows through the malformation (Fig. 3). It is performed in the angiography suites of the radiology department. A small incision is made in the groin and a catheter is inserted into an artery then passed through the blood vessels to the feeding arteries of the AVM. Occluding material, either coil or acrylic glue, is passed through the catheter into the AVM. The procedure time can vary, and the patient remains in the hospital several days for observation. The advantage of this treatment is that it is less invasive than surgery and can be used to treat deep or inoperable AVMs. Disadvantages include the risk of embolic stroke from the catheter and rebleeding because the AVM is not completely obliterated. Multiple treatments may be necessary. Figure 3. During an endovascular procedure, a microcatheter is inserted into the arteries feeding the AVM. Materials, such as glue or coils, are inserted into the abnormal arteries to block the flow of blood into the AVM nidus. Using general anesthesia, a surgical opening is made in the skull, called a craniotomy. The brain is gently retracted so that the AVM may be located. Using a variety of techniques, such as laser and electrocautery, the AVM is shrunken and dissected from normal brain tissue. The length of stay in the hospital varies between 5 to 7 days, with some short-term rehabilitation. The type of craniotomy performed depends on the size and location of the AVM. The option of surgery also depends on the general health of the patient. The advantage of surgical treatment is that a cure is immediate if all the AVM is removed. Disadvantages include the risk of bleeding, damage to nearby brain tissue, and stroke to other areas of the brain once the AVM is removed. Ogilvy CS, et al. : Recommendations for the Management of Intracranial Arteriovenous Malformations. Stroke 32: 1458-71, 2001. Kano H et al: Stereotactic radiosurgery for arteriovenous malformations, Part 1: management of Spetzler-Martin Grade I and II arteriovenous malformations. J Neurosurg 116:11-20, 2012.
aneurysm: a bulge or weakening of an arterial wall. arteriovenous fistula: an abnormal passage or opening between an artery and a vein. arteriovenous malformation: abnormality of blood vessels where arteries shunt directly into veins with no intervening capillary bed. capillary telangiectasia: abnormal collection of enlarged capillaries. cavernous malformation: abnormal collection of blood vessels with no well defined feeding arteries or draining veins. craniotomy: surgical opening in the skull. dura mater: a tough, fibrous, protective covering of the brain and spinal cord. embolization: blockage of a blood vessel so blood can no longer flow through it. endovascular: occurring within the blood vessels. hemorrhage: bleeding in the brain, which may cause a stroke. hydrocephalus: swelling in the brain due to a blockage of cerebrospinal fluid. 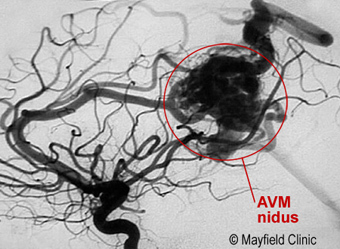 nidus: the central part of an AVM. occlusion: the process of closing. shunt: diversion of fluid (blood, CSF). subarachnoid hemorrhage: bleeding in the space surrounding the brain; may cause a stroke. venous malformation: abnormal tangle of veins. venous sinus: a blood filled channel that lacks normal vessel walls. Mayfield Brain & Spine treats about 70 people with arteriovenous malformations (AVM), cavernomas, and AV fistulas of the brain each year. Through our affiliation with premier hospital systems in the Greater Cincinnati-Northern Kentucky region, Mayfield doctors care for people who have brain aneurysms, brain hemorrhages, blocked carotid arteries, moyamoya, vasospasm, and related diseases. We work collaboratively with neurologists, neuroradiologists, neurointensivists, and radiation oncologists to bring you the very best care available. Endovascular describes the minimally invasive technique of accessing the AVM from within the bloodstream, specifically during angiography, to treat the vessels with coils or glues.